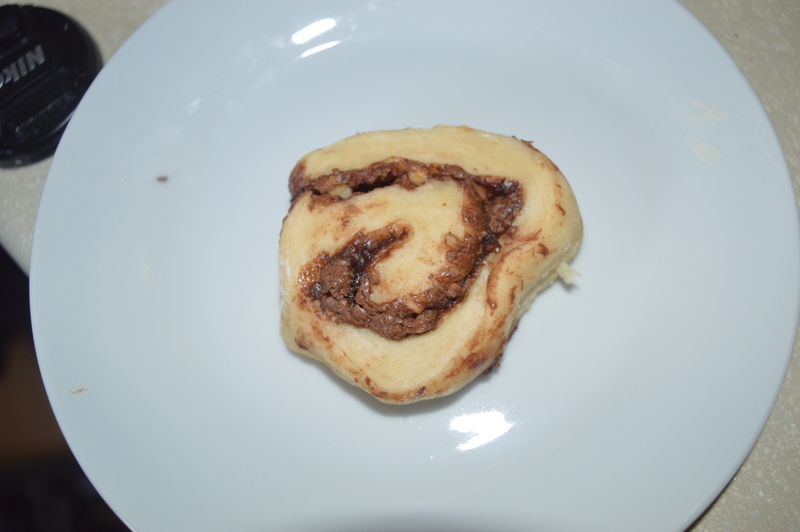 Sometimes, a new take on a tried and tested recipe produces some great results, especially where Nutella is involved. 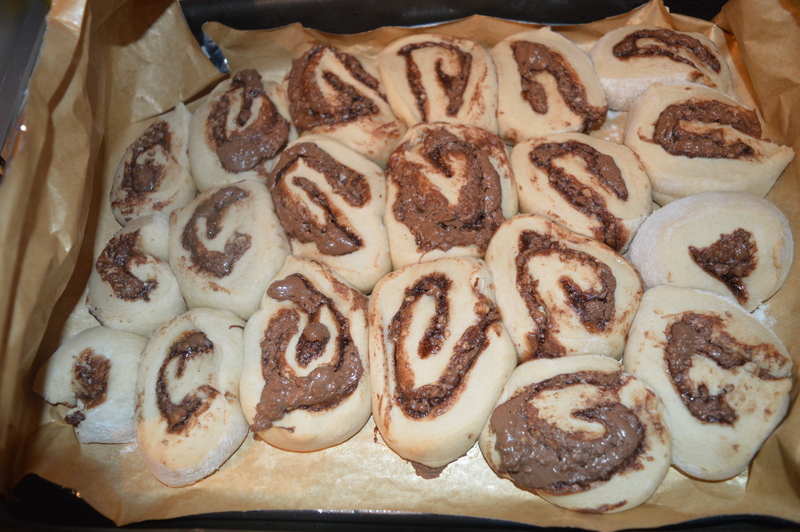 After quite a strenuous day at work on Wednesday all I really wanted to do with my evening was bake and eat Nutella, so I combined both of these wants into Nutella rolls, a recipe that combined the sweet bread dough of cinnamon rolls minus the glaze and my lifelong love of Nutella. Part of the magic of this recipe is waiting for the dough to rise, kneading the dough de-stresses you and works up an appetite and this makes enough to share these with others. 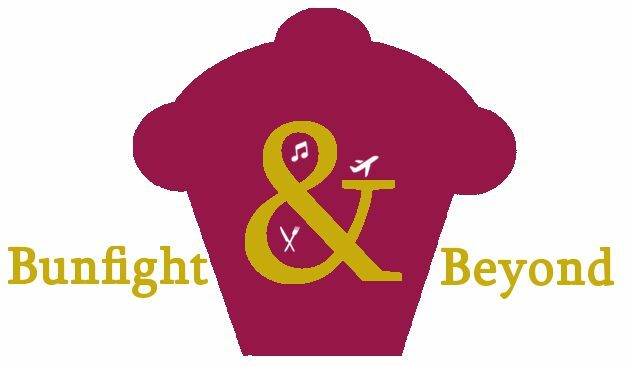 As it is well documented that baked goods make everybody happy I urge you to give these a try. 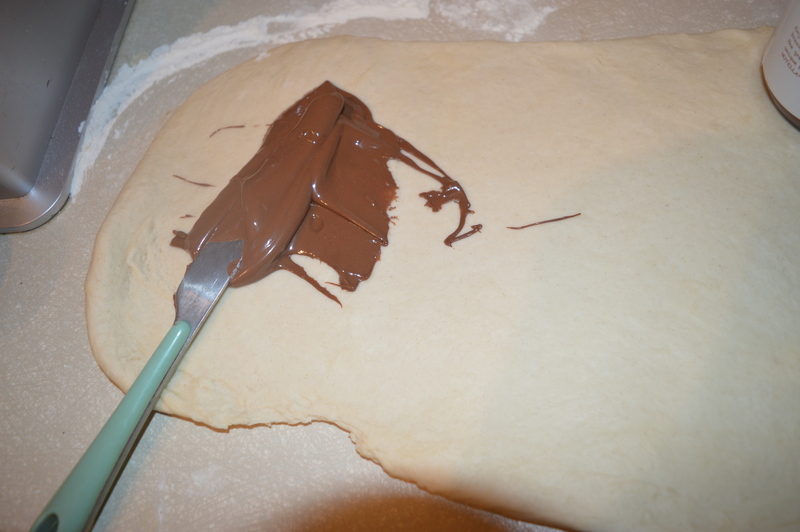 To make the dough dissolve the sugar in the milk. To this add the yeast and leave for 15-20 minutes until the yeast has started to froth. 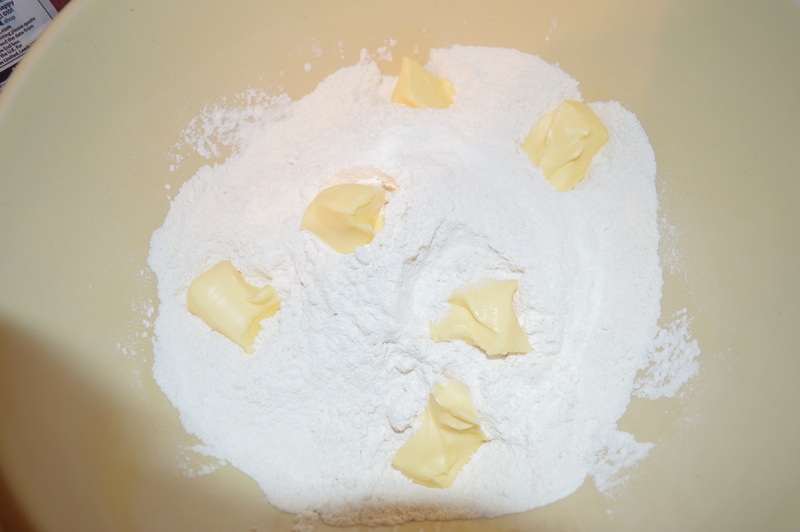 Meanwhile rub the butter into the flour and salt to make breadcrumbs. 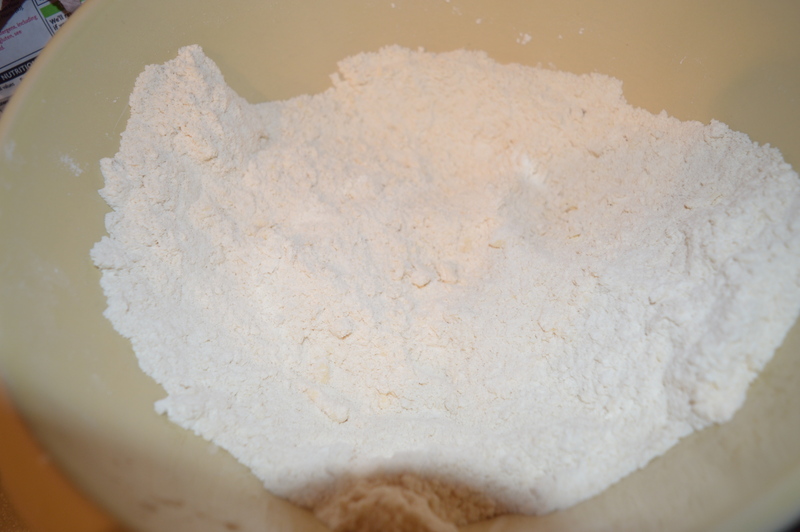 Make a well in the flour mix and add the milk and combine with your hands to make a rough dough. 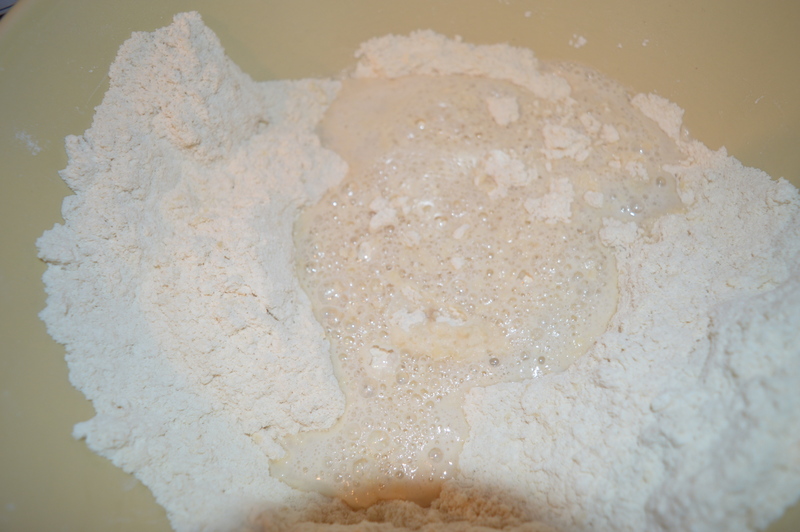 On a lightly floured surface, knead this dough for 10-20 minutes until the dough is smooth and elastic (pretend you’re working on your “guns”). 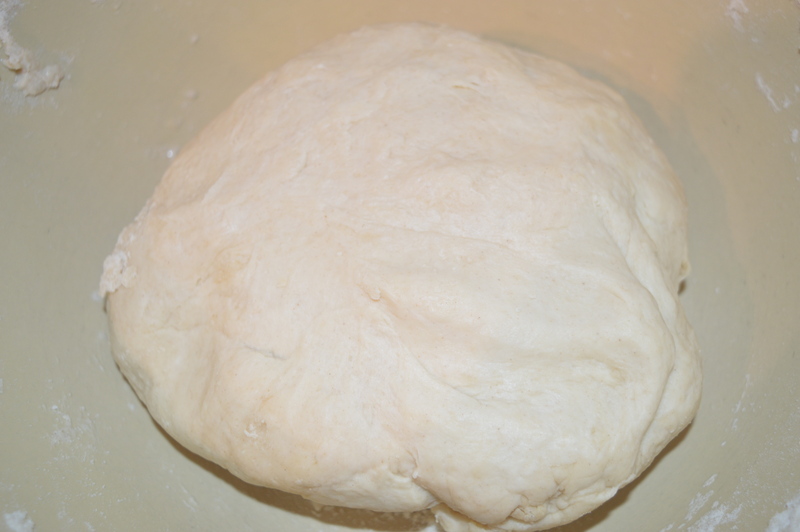 Put the dough ball in a large bowl and leave to rise for around 40 minutes in a warm place. 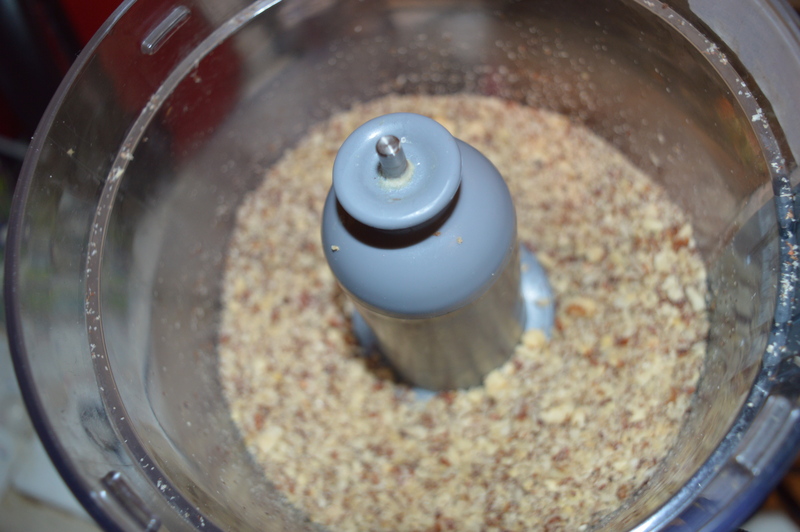 While you’re waiting for the dough to rise, I would use this time to chop your nuts if you have whole ones. Whole nuts are way cheaper than the chopped ones (I checked this in my local supermarket) and any you don’t use can be used to top cereal, ice cream, salads or toast as desired. 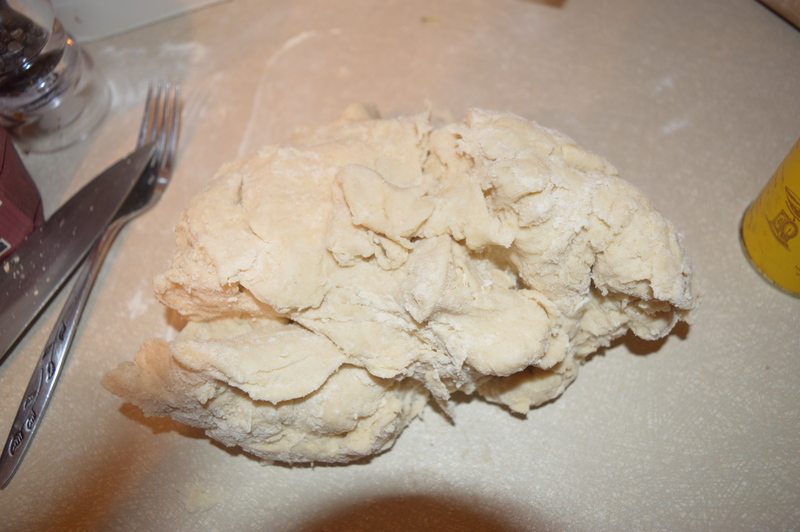 Once your dough has more or less doubled in size knock back the dough and roll it out into a rectangle about 1 inch thick. 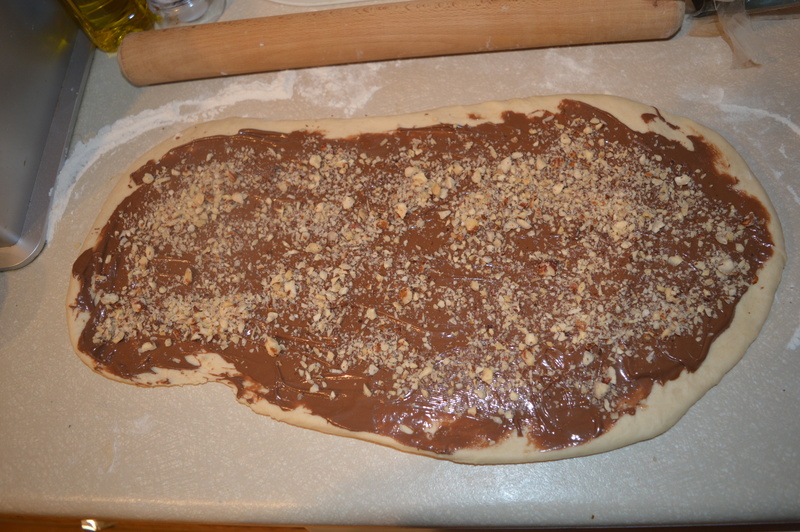 Spread over your Nutella and sprinkle over the hazelnuts. 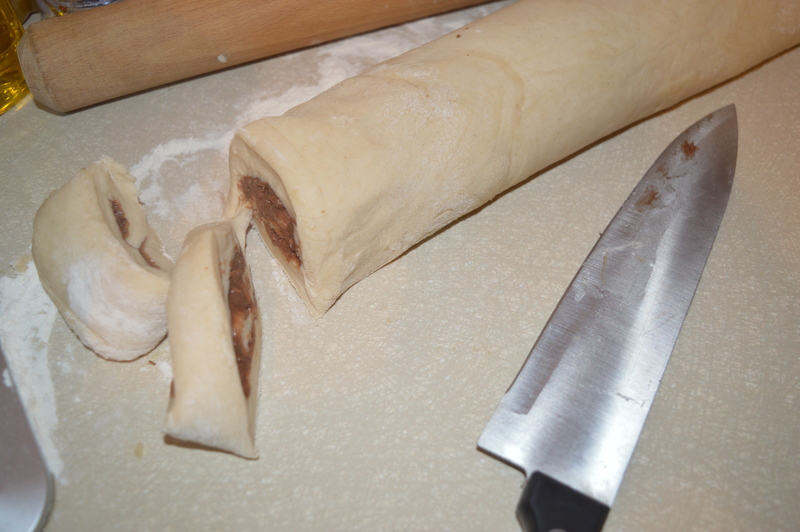 Then roll into a sausage shape and slice into what you think are appropriately sized rolls. 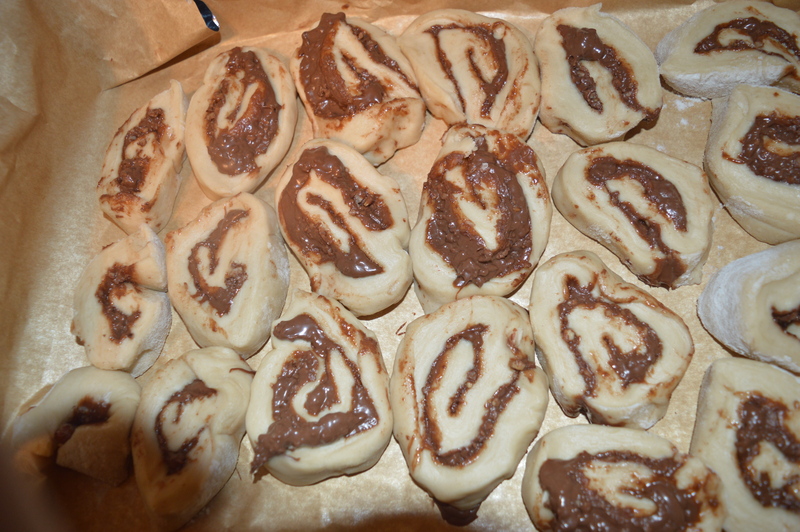 Lay these out onto a lined baking tray and allow to rise for 15 minutes. While your rolls are rising preheat your oven to 180°C. If you want to glaze them brush them with a beaten egg before baking (I had run out of eggs that night so didn’t other). Bake the rolls for 10-15 minutes or until the dough is slightly golden. 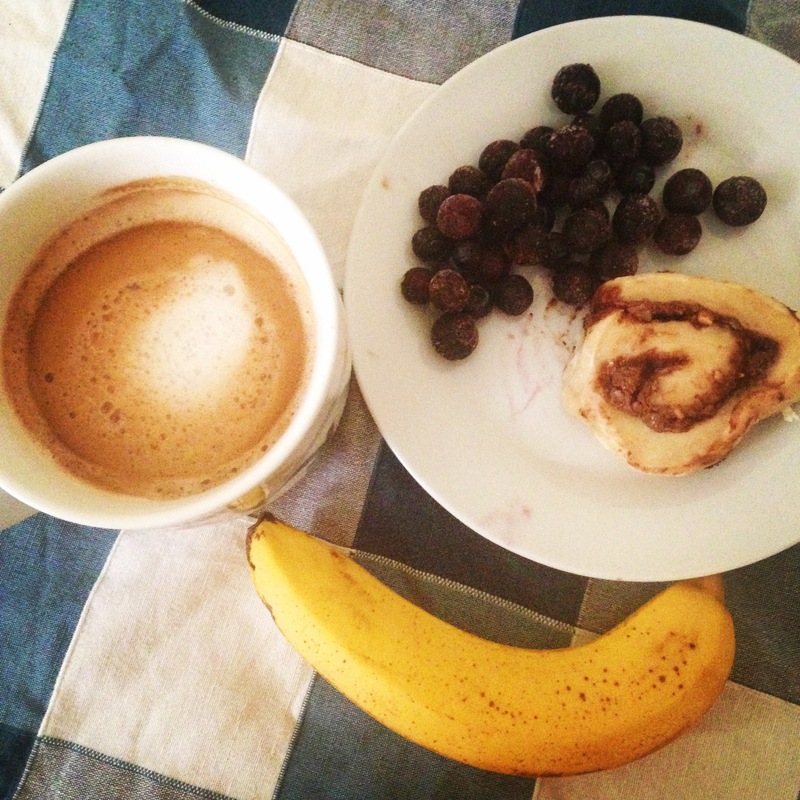 These are perfect to eat at any time of day, but we especially enjoyed them for breakfast.